It is tempting for New York City food advocates to focus their attention on the many local policies under the purview of New York City government: improving school food; easing access to SNAP; or supporting urban farms and farmers markets. City agencies are responsible for the food system within the five boroughs, and city officials see a clear justification for policies that help New Yorkers. By contrast, regional food policy is a much harder sell. The metropolitan region includes New York’s two neighboring states, some 31 counties, and roughly 700 separate municipalities. Its population includes 23 million people. Distinct jurisdictions, competing needs and interests, fractious politics, and the lack of regional governance structures makes coordination complex. And elected officials are often reluctant to invest city tax dollars, and their political capital, on policies that benefit other communities. But two recently released reports, a study of food distribution within New York City’s boundaries, called Five Borough Food Flow, and New York City’s annual Food Metrics Report, show that food planning at the regional scale is essential for a more efficient, resilient, and equitable food system. This brief discusses 10 reasons why. 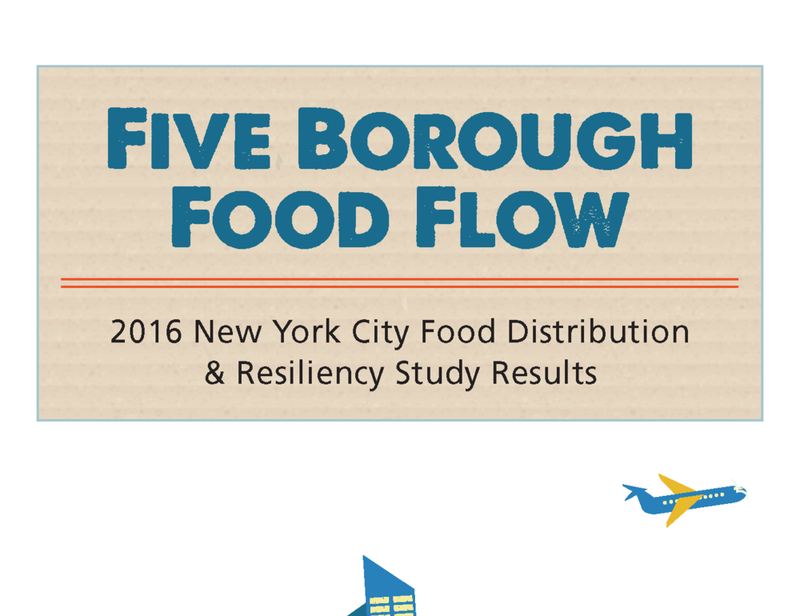 According to Five Borough Food Flow, approximately 19 billion pounds of food moves throughout New York City each year, transported by thousands of distributors to roughly 42,000 point-of-sale outlets, from bodegas to big box stores. More than half of this food travels over just four bridges and two tunnels, with between 5.5 and 12.1 million tons of food transported to and from the city daily via the George Washington Bridge. The last mile of food delivery occurs almost entirely (99%) by truck. Ensuring the efficiency and security of the network of warehouses, food hubs, distribution facilities, transportation routes, and retailers that distribute such a large quantity of food depends on a well-coordinated regional transportation system. The city alone cannot reduce traffic congestion, improve roadway safety, and protect multi-state bridges and tunnels from disruptions. This requires regional planning and infrastructure management by multi-jurisdictional authorities like the New York Metropolitan Transportation Council and the Port Authority of New York and New Jersey. The benefits of such an effort include reduced air pollution and greenhouse gas emissions, as well as more efficient movement of food. Improving transportation and wholesale distribution costs would help to moderate food costs. Transportation accounts for about 3.2 cents of every food dollar (a percentage that has decreased in recent years due to lower fuel prices), while wholesale trade accounts for another 9.1 cents. Reducing both through investments in regional transportation and distribution infrastructure, and government incentives to make distribution infrastructure more efficient, can keep retail food prices down while producing co-benefits like reduced air pollution and greenhouse gas emissions. One opportunity to reduce such costs involves developing a regional system of food hubs. In 2015, a regional food hubs task force established by NYC and the Governor’s office recommended such a network. Regional food hubs would promote regional agricultural products, facilitate on-farm processing and aggregation near points of production, increase value-added products, and reduce distribution costs. The task force also recommended policies to build relationships among farmers, distributors, and buyers throughout the state to support producers and manufacturers of New York State products. A key concern is ensuring that such a network is designed, financed, and operated to address the needs of communities of color by supporting existing businesses and community-based initiatives. A truck making a delivery in Manhattan. Public domain. Regional food planning can also address the environmental injustices that arise from concentrations of food businesses in neighborhoods like Hunts Point in the South Bronx, which is home to the Hunts Point Food Distribution Center, the largest geographic cluster of food distribution in New York City. Hunts Point moves 4.5 billion pounds of food annually, half to NYC retailers and half to other retailers in the region. As Table 1 shows, approximately 2,500 trucks and tractor-trailers drive through Hunts Point to and from the market daily to transport this large quantity of food. Table 1. Number of trucks and tractor-trailers that drive through Hunts Point daily, 2013-2016. Hunts Point is a predominantly Hispanic (76%) and Black (22%) neighborhood, with a poverty rate (43%) twice as high as the city average (21%). The diesel trucks traveling to and from the food market emit airborne fine particulate matter (PM2.5) at levels (9.8 micrograms per cubic meter) higher than the city average (8.6 micrograms per cubic meter), contributing to twice the rate of asthma hospitalization among children ages 5 to 14 than citywide, and twice the rate of adult asthma hospitalizations as the city average. New York City has taken numerous steps to improve the environmental conditions of Hunts Point and to reduce the environmental impacts of truck traffic to and from the food distribution center. For example, the Department of Transportation’s Hunts Point Clean Trucks Program replaced and retrofitted 500 older diesel trucks with more efficient models. The NYC Economic Development Corporation is creating an alternative fuel station in the Food Distribution Center providing biodiesel, Compressed Natural Gas (CNG), and ethanol to encourage truck conversions from diesel to cleaner fuels. And the city is upgrading rail infrastructure at the market to reduce dependence on trucks. Regional transportation planning would further reduce the environmental health impact borne by Hunts Point residents by expanding cleaner transportation options for the Food Distribution Center, including: better coordination between Metro North and Amtrak; infrastructure investments to enable the use of larger, more efficient rail cars; and innovative cleaner transportation, like waterborne freight. These improvements alone will not eliminate the substantial disparities facing the people of Hunts Point, but they can improve environmental conditions in the community. Distributors pick locations based on various costs, namely energy, labor, and transportation to customers. These can vary significantly within the region depending on the distribution channel and location of a distributor’s customer base. But local jurisdictions also have tools to attract and keep businesses, including direct subsidies or tax breaks. For example, when the Hunts Point Terminal Produce Market’s lease came up for renewal several years ago the market considered a move, entertaining an offer of subsidies to relocate to the New Jersey Meadowlands. Eventually, a commitment by Governor Cuomo and Mayor Bloomberg in 2012, pledging $50 million in state funding and $87.5 million in capital funds and tax incentives from New York City, kept the market in the South Bronx. This was followed by support from Mayor de Blasio in 2015 for $150 million to upgrade the market. There is significant debate about whether this kind of competition among local government for jobs and tax revenue results in inefficient beggar-thy-neighbor outcomes. Regional planning cannot prevent governments from chasing businesses, but it can help to measure the regional advantages and disadvantages of such policy choices and make the costs and benefits transparent to taxpayers. No single New York City food distributor or food hub has more than 15% of the market, fragmentation that makes the food system somewhat resilient. However, the clustering of food distribution businesses in and around the Hunts Point Food Distribution Center remains a big vulnerability. Protecting the Hunts Point peninsula from flooding and upgrading the market’s infrastructure is key to enabling the city’s food distribution system to rebound from climate change-induced weather events, as well as disruptions due to infrastructure failures unrelated to weather, like power grid failures or acts of terrorism. Since national foodservice distributors and national grocery distributors are more likely than regional distributors and NYC-based wholesalers to invest in resilience measures (like emergency power and reserves of vehicle fuel) for their own facilities, planning to support a mix of national, regional, and local food suppliers and distribution firms is critical to preventing the kinds of system-wide disruptions that occur when infrastructure is geographically concentrated or composed of a small number of firms. Protecting regional infrastructure – from the electricity grid to the region’s highways – from the effects of extreme weather events is critical, as point-of-sale food businesses in a congested region like ours rely on just-in-time inventory, keeping on average only 4-5 days of stock. Equally critical is planning to ensure that the region’s most vulnerable communities have access to food and water in the event of a disaster. As we learned from Superstorm Sandy, disruptions to the supply chain can leave low-income, physically isolated communities without sufficient food. Planning for environmentally friendly and reliable backup infrastructure and program contingencies across the region, including in suburban communities and smaller cities, requires regional coordination. Approximately 90% of New York City’s drinking water comes from surface reservoirs in a mostly rural 1,600 square mile watershed in the Catskills. Our water is treated and purified but is not filtered, a process required by the Safe Drinking Water Act for all other large surface water supplies. Filtration for water that is otherwise very pure would have cost the city an estimated $10 billion in capital costs and $100 million in annual operating costs, placing a burden on water rate payers, including owners of affordable housing. In the 1990s, New York City negotiated a waiver from the federal filtration rule by committing to land acquisition in the watershed and various programs to help the farmers and communities in the watershed adopt practices to minimize pollution to the streams that feed the city’s reservoirs. One such program is the Watershed Agricultural Program, which provides financial help to farmers in the city’s watershed. As Table 2 illustrates, the number of farms in this program has increased, along with acreage. By enabling farms to operate sustainably within the watershed, these funds help them and their surrounding communities to thrive, and forestall local pressure to permit forms of economic activity, such as sprawling residential development or shopping malls, that would attract residents and infrastructure that would threaten the water supply and necessitate filtration. Programs to support farmland conservation and to enable farmers in the region to sell directly to consumers through food hubs and farmers markets provide similar indirect protection to other watersheds, including sensitive groundwater aquifers in the New Jersey Pinelands and the Long Island Pine Barrens, by forestalling development. Ensuring the success of the Watershed Agricultural Program and other policies to support regional farms is key to both local food and safe drinking water. Maintaining a vibrant agricultural sector is important not only for the food produced and to protect water supplies, but also to conserve working landscapes in an increasingly dense region, preventing auto-dependent sprawl and reducing carbon emissions that contribute to climate change. To maintain working farmland and recreational opportunities accessible to the region’s growing population it is essential to ensure the financial viability of farms and the communities that support them. Doing so requires regional farmland planning, succession planning for farm owners, agroforestry opportunities for owners of forested land, and zoning and financial assistance to keep farms in food production, efforts best organized at a foodshed, not municipal, scale. Another important mechanism to support regional agriculture is the public plate – the purchase by local governments of food grown, raised, and processed within the region for school lunches and other public feeding programs. In New York City, for example, Local Law 50 of 2011 encourages city procurement officers to preferentially buy New York State grown, produced, harvested, or processed food, allowing an optional 10% “price preference.” In 2016, the NYC Department of Education alone purchased $28 million worth of local produce, milk, and yogurt, 4% more than in the previous fiscal year, and added to the lunch menu a hamburger produced from New York State-raised cows that are past their milk-producing age. Regional agriculture can also be bolstered through marketing campaigns and economic development investments, like the financial support provided by Governor Cuomo’s administration for upstate producers of Greek yogurt. A better-coordinated regional market for locally grown institutional food could achieve economies of scale, improvements in nutrition and reductions in food insecurity. One of the last remaining major sources of water pollution is combined sewer overflow (CS0), the mix of storm water and untreated sewage that overflows into waterways when it rains. Conventional infrastructure to capture storm water, such as larger sewers and treatment plants, or holding tanks, is costly and unpopular. Green infrastructure, by contrast, is a cost-effective alternative. It involves making the city’s concrete and asphalt surfaces permeable, allowing rain to percolate into the ground instead of running into the nearest river. Vegetated surfaces – from extra-large tree pits to new parks -- not only prevent CSO runoff but also provide environmental and health co-benefits, such as reducing the urban heat island effect and air pollution. Urban agriculture is a form of green infrastructure that can be greatly expanded, helping to reduce water pollution while producing fresh vegetables. New York City’s green infrastructure program has in fact funded several innovative urban agriculture projects, including a large-scale rooftop farm at the Brooklyn Navy Yard that captures over 1 million gallons of storm water per year, helping to reduce CSOs flowing into New York City’s East River. Regional investment in large-scale urban agriculture-focused green infrastructure would reduce CSO pollution in the harbor, bight, and Long Island Sound, while providing communities throughout the region with fresh food and other benefits associated with urban food production. A local compost pile. Public domain. Organic waste, from food scraps to grass clippings, account for one-third of the NYC household waste stream, 80% of which is now landfilled in surrounding states (1/3 in Pennsylvania, ¼ in Virginia). The de Blasio administration has implemented a “Zero Waste” initiative that includes commercial composting regulations and pilot household composting programs. The commercial program requires businesses generating large quantities of organic waste (e.g., food service establishments, food manufacturers, or food wholesalers) to separate their food waste for composting. To be successful, however, regional composting facilities will have to be developed, as will a market for the end product. A recent study by the Citizens Budget Commission found that the composting facilities located within 150 miles of New York City had the capacity for only 176,000 tons of waste per year, just 10% percent of the quantity discarded by New York City households and businesses. New York City has proposed new aerobic composting facilities and has explored co-digestion of organic waste at its wastewater treatment facilities, but the supply of organic matter may soon exceed processing capacity, especially if composting expands in other jurisdictions within the region. Regional planning for organic waste management is needed to ensure not just the right amount of infrastructure and end uses, but to be sure that facilities are located fairly throughout the region and do not impose environmental harms on communities already burdened by industrial infrastructure. Another food residual that needs regional management is waste cooking oil. New York City policy requiring heating oil to contain a small amount of biodiesel spurred a waste oil reclamation and biodiesel processing industry. As a result, restaurants have been able to reduce their waste disposal costs and the life-cycle environmental impacts of heating fuel have been decreased. But like composting, biodiesel production requires processing infrastructure, so expanding cooking oil recycling and other food recycling policies requires planning for infrastructure and markets at a regional scale. Congressional Republicans and Donald Trump have pledged to cut federal food and nutrition programs, deport immigrants, and reduce regulations across the board, policies that will have a significant negative impact on the region’s poorest and most vulnerable. Regional support for food programs like SNAP, school food, and other federal food policies, especially bipartisan support of mayors and governors, can help to thwart some of these regressive efforts. With planning and coordination, regions can also serve as laboratories for new progressive food policies. Political coordination requires a regional food planning body to identify policy opportunities among public authorities, special districts, and government agencies that span multiple jurisdictions. Regional planning also creates the possibility of new and stronger alliances among urban and rural groups, farmers and eaters, and environmental and food justice advocates, useful counters to the conservative vision of a market-dominated society. Rep. Paul Ryan (R-WI) Speaker of the United States House of Representatives, has proposed significant cuts in funding for SNAP and other benefit programs. Public domain. Regional food planning holds the promise of a more sustainable, equitable and rational food system for the New York and other metropolitan regions. It can bring health, economic, environmental and social benefits that result from an integrated approach to food, agriculture, transportation and economic development. However, regional planning faces a number of obstacles. Strong ideological commitment to local land use controls makes regional land use planning difficult. The lack of democratic institutions with a mandate and capacity to plan for food makes collaboration among jurisdictions challenging. Making equity and the inclusion of excluded populations (e.g., farm workers or undocumented people) a priority will require political organizing at the regional scale. And local government dependence on property tax revenue favors competition, not cooperation, among communities. However, cities as diverse as Philadelphia, Chicago, and Portland have crafted regional food plans that address some of the issues discussed above. These have typically been developed by metropolitan planning organizations, appointed bodies responsible for regional transportation planning, with the support of philanthropies and the involvement of a wide range of stakeholders. In the New York metropolitan area, this work could be coordinated by regional organizations, with input from a wide range of public authorities, state and local agencies, academics, activists and NGOs.